A statue of Edward Colston towers over a square off Colston Avenue in Bristol, England. A small plaque calls Colston "one of the most virtuous and wise sons" of the city. Officials plan to install another plaque explaining his links to the Atlantic slave trade. 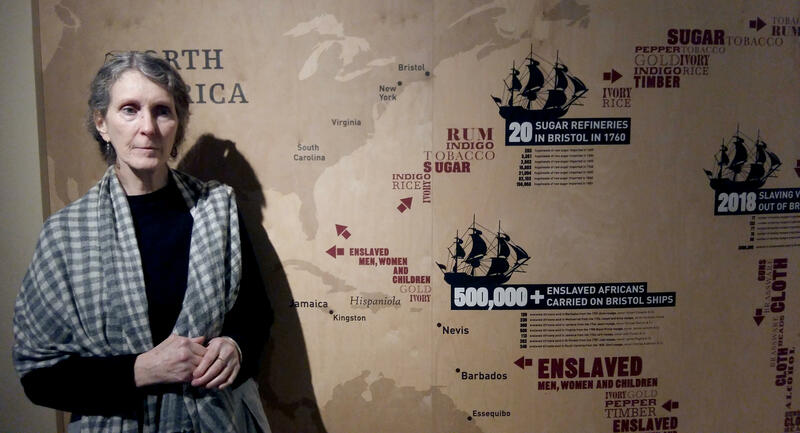 Sue Giles is an historian and curator at the M Shed, a Bristol museum with an exhibit on the city's historic role in the Atlantic slave trade. A mural by artist Michele Curtis is on display in St. Paul's, a traditionally Afro-Caribbean neighborhood of Bristol. Curtis is angry that streets and landmarks are named after slave merchants, so she's been painting murals on city walls to honor the lives of the city's black residents. 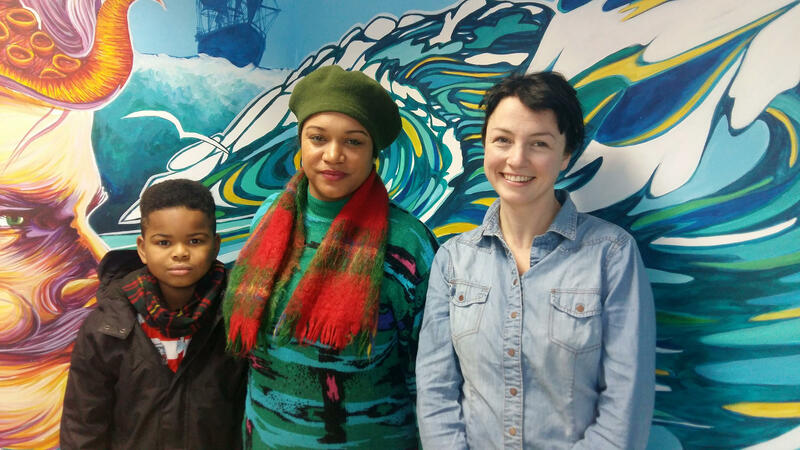 Katie Finnegan-Clarke (right) and Cleo Lake (center), standing with Lake's son, help run Countering Colston, an activist group lobbying for Edward Colston's name to be removed from city streets, schools and landmarks. A statue of a merchant from the 17th century towers over the main square in Bristol, in southwest England. 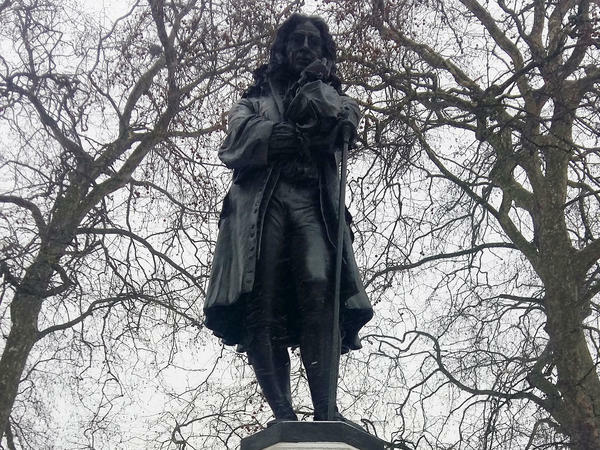 It's a tribute to Edward Colston, described on a small plaque as "one of the most virtuous and wise sons" of this city. Around town, there are numerous reminders of Colston, Bristol's most famous philanthropist: Streets, schools, a concert hall and an office tower are all named after him. A big stained glass window in Bristol Cathedral is dedicated to him. Even a local delicacy bears his name — the Colston bun, a sort of fruit strudel. But there's also a dark side to Colston, one that's been long known but less prominently acknowledged: He made his fortune trading African slaves. "I remember finding out how he made his money. That turned my world upside down," says Katie Finnegan-Clarke, 30, who attended Colston's Girls' School, a prestigious private school. When she was 14, one of her parents' friends told her about Colston's role in the slave trade. "Having partaken so actively in so many school assemblies to celebrate him, it just made me feel sick," she says. "It disturbs me." In the 17th and 18th centuries, Bristol's port sent thousands of ships to trade African slaves for tobacco, sugar and rum in the New World. Colston was a member and later head of the Royal African Company, which held a slave-trading monopoly in Britain. He also traded sugar and other commodities harvested or produced by slaves in the British West Indies. He bequeathed his wealth to charities in his hometown, founding homeless shelters known as almshouses and many schools. Now, in the era of Black Lives Matter, and just as Confederate statues are taken down in some parts of the American South, Bristol is rethinking how it commemorates its biggest benefactor. Trustees of the city's premier music venue, Colston Hall, announced last year that when the facility reopens in 2020 after renovations, it will do so under a new name, as yet unannounced. "We just couldn't reopen a building with some public money in it that was under the banner of a slave trader," says spokeswoman Sarah Robertson. "There are sections of Bristol society who feel shame and embarrassment stepping into our building because of our name." For years, the rock band Massive Attack, whose members come from Bristol, has refused to play at Colston Hall because of its name. That boycott grew two years ago with the creation of Countering Colston, a group of artists and activists lobbying for the removal of Colston's name from Bristol's institutions. The group was founded by Finnegan-Clarke and some of her former classmates. While many activists have praised plans for the name change, there has also been criticism. The BBC reported last year that opponents of the name change made comments on Facebook calling it "political correctness gone mad" and saying the "past should not be airbrushed out." "We were accused of erasing history by changing the name," Robertson says. "People thought we were dredging up a past that people would rather not remember. They want to forget about Bristol's slave-trading past." Curators at a Bristol museum, the M Shed, want to make sure that doesn't happen. The museum is located on a wharf in Bristol's harbor, where slave ships used to dock. Inside, there's a video of a spoken-word performance about racial stereotypes by Bristol's first poet laureate, Miles Chambers, who is black. There is also a huge map of the city from 1769, showing all the landmarks built with the profits of slavery. 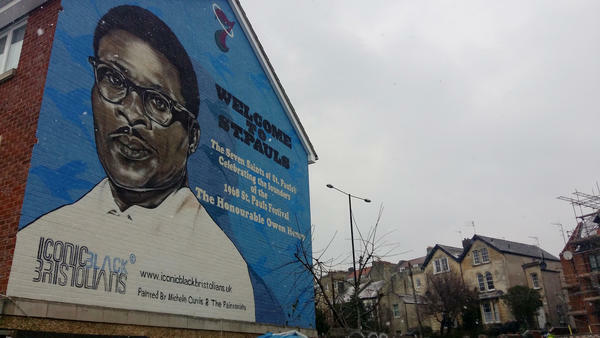 "The idea is just to know that an awful lot of Bristol is built on the slave trade. From big houses, to the Bristol Old Vic — the oldest working theater in the country," explains curator Sue Giles. Giles does not agree with the Countering Colston activists, who want Colston's name erased from the city. It's better to remember, she believes. "If you keep changing everything, people forget," she says. "You don't know who Colston was, so there's no discussion of his role in the slave trade, about Bristol's role in the slave trade." But for many black Bristolians — who are a small but growing part of the city's population — having to see Colston's name on streets and buildings across their city is painful. Most black people in Britain are of Afro-Caribbean descent. Some of their ancestors were African slaves brought to Jamaica and other British territories before Parliament outlawed slavery in 1833. "We're not at that position yet where there's enough empathy with the journey that people who were enslaved have been through," says Cleo Lake, 38, an artist and activist whose father is from Jamaica. "I'm very angry at the fact that my taxes have gone towards lining the pockets of elite people, who still hold a lot of that wealth. I definitely believe in reparations." Only in 2015 did Bristol taxpayers finish paying off the equivalent of $428 billion (in today's dollars) in loans the city took out in 1833 to compensate slave merchants for the loss of their trade, after slavery was outlawed. Lake attended Colston's Girls' School and helped found the Countering Colston group. Her next target is the giant Colston statue towering over a city square, off Colston Avenue. She wants it removed. Bristol "has given the statue of Colston a pride of place, and this doesn't sit right with me anymore," she says. The city recently announced plans to install a new plaque on the statue, to explain Colston's links to the slave trade. But it says the statue will remain where it is. After Colston Hall announced its plans for a name change, Colston's Primary School followed suit, saying it will change its name ahead of the start of the next school year in September. But Colston's Girls School has refused to change its name. Bristol's Old Vic Theater, founded 250 years ago by local slave merchants, has launched a "year of change" in its programming, to ensure black playwrights are represented in its repertoire, says chief executive Emma Stenning. She sees a link between what's happening in Bristol and the United States. "You see many cities and many communities asking themselves, 'What are the things we choose to commemorate? What's missing from the history that we are telling?'" Stenning says. "That is definitely in the air." In St. Paul's, a traditionally Afro-Caribbean neighborhood, artist Michele Curtis is taking matters into her own hands. She's been painting murals on city walls to honor the black citizens of Bristol. She'd like to see the city rename some of its landmarks. "All the streets are named after slave merchants. But you don't really see that for black people that have contributed," Curtis says. "Of course, it's just the name of a building. It's not really that important. But it would be a nice gesture." Confederate statues are being taken down in some parts of the American South. The city of Bristol in southwest England was largely built by 18th-century slave traders. Many streets and buildings are still named after them. But as NPR's Lauren Frayer reports, the city is making some changes. LAUREN FRAYER, BYLINE: Rehearsals are underway at Colston Hall, Bristol's premier music venue. It's a landmark. The Beatles played here. But after 150 years, it's decided to search for a new name. SARAH ROBERTSON: There are sections of Bristol society who feel shame and embarrassment stepping into our building because of the name. FRAYER: That name, Colston, says spokeswoman Sarah Robertson, comes from a slave merchant, Edward Colston, on whose wealth much of this city is built. In the 1700s, Bristol's port sent thousands of ships to trade African slaves for tobacco, sugar and rum in the New World. Colston's name is on schools, streets and an office tower in Bristol, not as a slave trader but as this city's greatest philanthropist. It's a complex legacy. Some say his slaving past cancels out much of the good he did. KATIE FINNEGAN-CLARKE: We're kind of a mixture of academics and historians and artists. FRAYER: Katie Finnegan-Clarke went to Colston's Girl's School. Now, she helps run Countering Colston, which lobbied the concert hall to change its name. FINNEGAN-CLARKE: I remember finding out how he made his money. And that kind of turned my whole world upside down really. FRAYER: The latest controversy is over a large statue of Colston on Colston Avenue in the city center. Some say it's part of the city's history. Others want it removed. MICHELE CURTIS: At the moment, we're in St. Paul's in Bristol. All the streets are named after, you know, slave merchants. But you don't really see that for black people that have contributed. FRAYER: Artist Michele Curtis has been taking matters into her own hands, painting murals on city walls that honor the black citizens of Bristol. And she'd like to see the city rename some of its landmarks. CURTIS: Of course, you know, it's just the name of a building. It's not really that important. But, you know, it would be a nice gesture. It would be a step in the right direction. SUE GILES: On this wall, we've got a big map published in 1769. FRAYER: At a local museum, curator Sue Giles shows me just how many Bristol landmarks were built with the profits of slavery. But she doesn't quite agree with the Countering Colston activists who want his name erased from the city. GILES: If you keep changing everything, people forget. You don't know who Colston was, so there's no discussion of his role in the slave trade, about Bristol's role in the slave trade. UNIDENTIFIED ACTOR: We turn up our noses at each other, but life goes on and doesn't care. FRAYER: There's another big art center in Bristol, The Old Vic Theater, founded 250 years ago by slave merchants. It's run today by Emma Stenning, who says she's trying to come to terms with the theater's difficult past by adding works by black playwrights. She sees a link between what's happening in Bristol and a similar movement in the United States. EMMA STENNING: You see many cities and many communities asking themselves, what are the things that we choose to commemorate? What's missing from the history that we're telling? And that is definitely in the air. FRAYER: As for Edward Colston, the city is installing a plaque to explain his links to the slave trade. But the statue will remain towering over Bristol's city center. Lauren Frayer, NPR News, Bristol, England. (SOUNDBITE OF THE REDNECK MANIFESTO'S "I AM BRAZIL") Transcript provided by NPR, Copyright NPR.